So last week we made the beads, this week we’ll make the bezel and bail…they’re really easy too! I promise. 1. 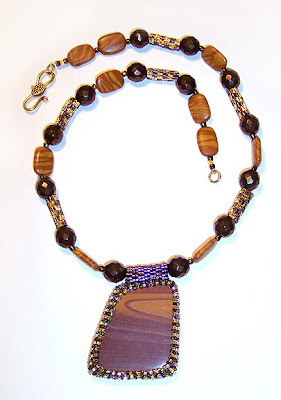 Stitch a flat strip of RAW, just a scant 1/8 to 1/4 inch shorter than the stone’s perimeter, using 11/0 seed beads. This little bit of stretch will keep the stone snug. 2. Turn your strip and add 3 or 4 more rows of RAW, enough to cover the edge of your stone and extend past just a bit. Stitch the ends together to make a loop. 3. Switch to peyote stitch. Still using 11/0 seed beads, add one row of peyote stitch on one of the bezel edges. Slip it on the stone and pull the thread snug. Remove from the stone again. 4. Add one row of peyote stitch using 15/0 seed beads. Slip it on the stone and pull the thread snug. Work the thread to the other bezel edge and repeat the two peyote rows on the other side. 5. Work the thread to the middle of the bezel and set it aside. 6. Create a beaded bead according to the directions from last Technique Tuesday. 7. Use the thread and needle from step 5 to stitch the beaded bead onto the bezel to form a bail.